The Inverse Music Box sculpture is based on a Sankyo paper strip manivelle music box mechanism. The sounding tines of this music box are activated by holes punched in paper cards that are fed through the mechanism by a hand crank. In the Inverse Music Box the manivelle mechanism is attached to the top of a 1930s era "Sonora" tube radio external speaker cabinet, which is attached to a wall. The Sankyo mechanism is designed to produce twenty distinct chromatic pitches. In this sculpture the paper cards are permanently arranged in a loop through the mechanism. Mounted inside the Sonora speaker box is a modern loudspeaker, and a piezoelectric microphone is mounted directly underneath the music box mechanism. The cabling for both of these transducers runs to a hidden computer. A viewer/listener is invited to turn the hand crank to advance the cards and trigger the notes, Notes can also be added with the hole punch provided. The inversion of this piece is performed by the hidden electronics. 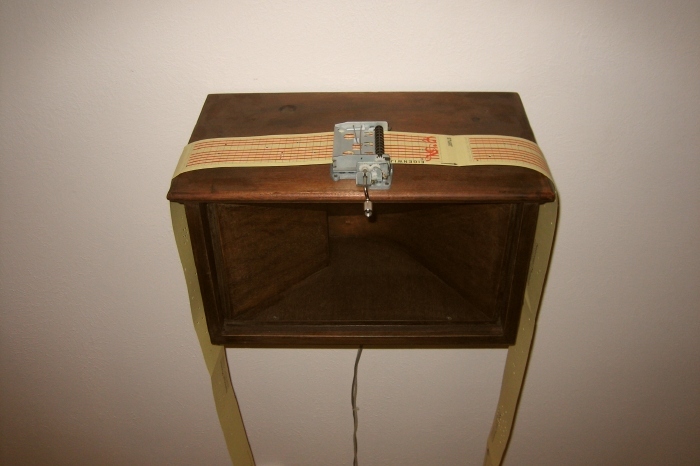 Instead of each note of the music box simply being ampliﬁed by the speaker, each struck note is subtracted spectrally from the sound the speaker is making and each of the twenty notes that is not plucked remains sounding. For example, if a chord of three notes is plucked, the sound produced by the speaker consists of a chromatic tone mass of the remaining seventeen tones. Only by triggering all 20 tones simultaneously does the speaker remain silent.